1891 - Brothers Albert and Gustav Stolz —distinguished watchmakers and former students of Henri Sandoz who was director of the Tavannes Watch Company— establish their Angelus watchmaking manufacture in Le Locle, Switzerland, a city world renowned for high-end watchmaking. They began with just a room on the Rue du Marais, modest beginnings for what would become an important brand. 1914-1918 - The First World War proves an obstacle to the development of Angelus, but does not prevent it from creating a repeater timepiece for blind people that is offered to returning soldiers who have suffered facial injuries. This gesture earns the Stolz brothers a letter of thanks from French army general Marshal Joffre. 1930 - Angelus starts selling the smallest —only 32 mm x 21 mm (10.5 lines)— 8-day movement in the world with an excellent precision of +/- 1 minute per week. This movement actually has a potential power reserve of 10 days. It remains the smallest 8-day movement in the world to this day. 1935-1937 - Angelus begins making two-pusher chronographs based on 29.33 mm and 33.84 mm (13 and 15 lines) manufacture movements with 30 or 45 minute counters. The first two-pusher chronographs appeared in 1933 and were made by Breitling, however the complication only becomes widespread after 1935, with Angelus and Universal prominent exponents of this type of chronograph. In 1936, Angelus launches caliber SF240, the smallest 8-day alarm movement then available. This movement is also produced without alarm function. In 1937Angelus launches the Foursome compact table clock, featuring an 8-day power reserve, automatic calendar, barometer and thermometer. 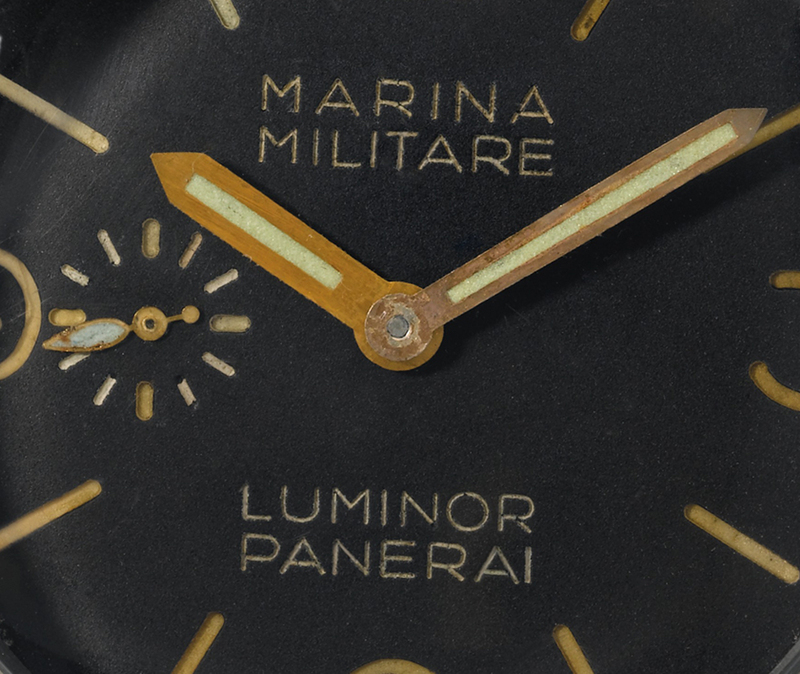 1939 - TheAngelus 8-day caliber SF240 is chosen by Panerai to equip watches for the Italian navy. Panerai watches equipped with the Angelus caliber SF240 can be recognized by the small seconds at 9 o'clock. This now iconic Panerai design element can be directly attributed to the Angelus caliber SF240. Images: Christie's and Bridgeman Images. 1942 - Angelus causes a sensation in the world of watchmaking by launching the world's first series chronograph with calendar. Initially christened Chronodate, then Chronodato from 1943 onwards, this remarkable chronograph is equipped with the 32.8 mm (14 lines) calibre SF217, which was derived from the calibre SF215 launched earlier in the year —and features 17 or 19 jewels and a 45-minute counter. Chronodato’s date is indicated by a central hand pointing to a chapter ring on the periphery of the dial; day and month are respectively displayed in windows at 6 and 12 o’clock. The Chronodato rapidly becomes Angelus’ top selling watch and goes on to become an icon of Swiss-made chronographs. With the exception of a few non-production models made by Patek Philippe featuring a calendar in 1937 and perpetual calendar in 1941, this was the first time that the date appeared on a production chronograph wristwatch. 1943 - Panerai equips its legendary Radiomir Mare Nostrum chronograph with Angelus’ calibre SF215, however, the watch stays in the prototype stage. Image: Christie's. 1945 - Angelus creates its most sophisticated travel instrument yet, the Sixome, featuring an 8-day power reserve, automatic calendar, barometer and thermometer – like the Foursome – in addition to a hygrometer and a compass. 1948 - Launches a new chronograph movement, the 27 mm (12 lines) calibre SF250 with 30-minute counter. This development paves the way for the brand’s masterpiece, the Chrono-Datoluxe. The Chrono-Datoluxe is the world's first series chronograph featuring a digital date display. It was at the same time the first wristwatch chronograph with a big date —two Arabic numerals, each one on a discrete, coaxial disc, displayed in a window at 12 o’clock, with the day also displayed in a window next to the date. A moon phase at 6 o’clock completes the indications. 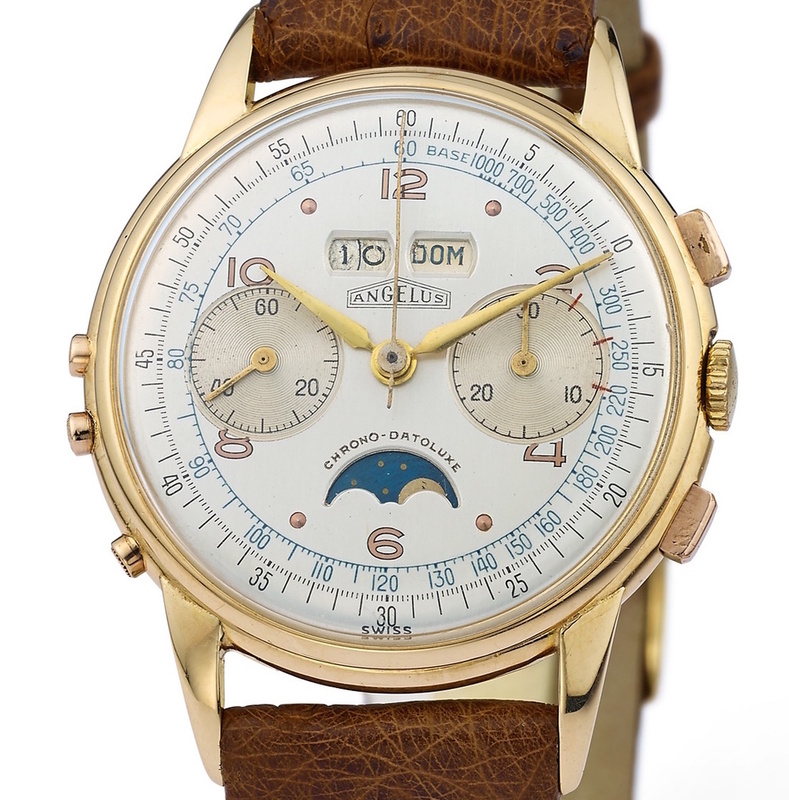 Angelus also made non-chronograph calendar watches both with moon phase —the Datoluxe— and without —the Dato 12— derived from the Chrono-Datoluxe calendar complication. 1956 - Angelus launches the Datalarm, the first wristwatch ever featuring both alarm and date function, the latter displayed in a window at 3 o’clock. The Datalarm comes in different versions, including a world-timer with 24-hour chapter ring on the bezel and, inside on the dial, the names of 24 cities, each representing a world time zone. 1958 - Angelus launches an extraordinary wristwatch, the Tinkler, which is both the first ever automatic repeater wristwatch as well as the first waterproof repeater wristwatch. The Tinkler’s repeater mechanism —activated by a ‘pump’ pusher similar to that used in Angelus’ waterproof chronographs— strikes on the hour and quarter hours. The Tinkler is so ahead of its time that only approximately 100 pieces were produced. This rarity means that the Tinkler becomes highly sought-after by watch collectors years later. The high precision of Angelus timepieces is evidenced by a series of first-class results at observatory timing competitions, while the superb craftsmanship of Angelus watches has been recognized by awards from international exhibitions including Paris (1902), Lille (1902), Liège (1905), Milan (1906), Bern (1914) and Philadelphia (1926). 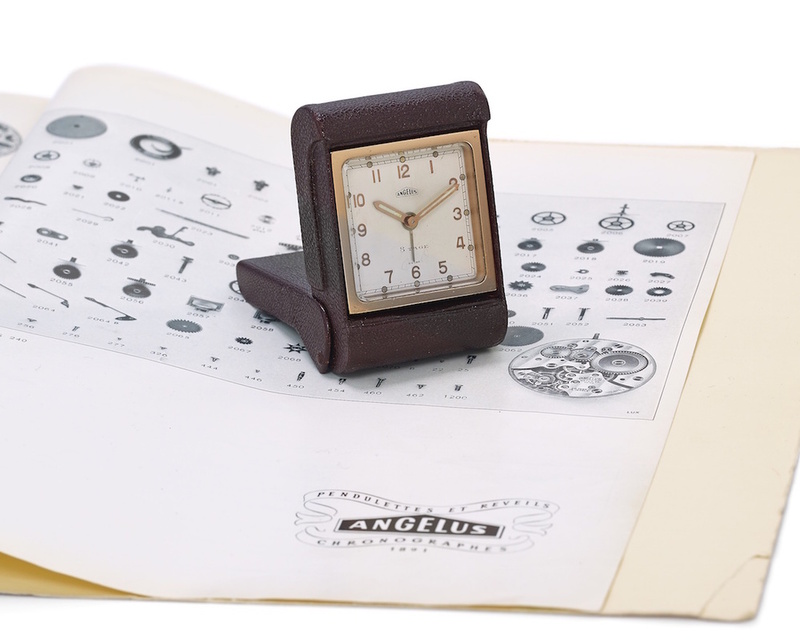 Like many other prestigious Swiss watch brands, Angelus fell victim to the quartz crisis in the 1970s and production halted. However, in 2011 Angelus was revived by the well-known and highly innovative mechanical movement specialist Manufacture La Joux-Perret SA in La Chaux-de-Fonds and its CEO Frédéric Wenger and Head of Innovation Dr Sébastien Chaulmontet. Angelus now has at its disposal a skilled and enthusiastic team committed to putting Angelus back on the pedestal of high-end watchmaking. Still enjoying the creative freedom afforded by having its own manufacture and using the brand’s rich history as a guiding principle and source of inspiration, Angelus has spent over four years developing the next generation of Angelus timepieces, which uphold the brand’s reputation for horological ingenuity. Featuring complications from classic watchmaking, ultra-modern materials crafted using cutting-edge techniques, highly visible movements and contemporary design cues, these innovative timepieces push the boundaries of contemporary watchmaking, while remaining true to the haute horlogerie traditions of the brand. As of 2011, Angelus is now owned by Manufacture La Joux-Perret SA, which operates out of its own manufacture in La Chaux-de-Fonds, the heart of fine Swiss watchmaking. The new Angelus base is a stone’s throw from where the Stolz brothers set up their first watchmaking manufacture in 1891. Today’s Angelus manufacture is fully equipped with a highly-skilled workforce allowing Angelus to design, produce, finish, assemble, regulate and test all of its movements and timepieces in-house. For non-movement components, e.g. cases, dials and hands, Angelus partners with the best suppliers in the Swiss luxury watch industry, many of which are close neighbors. Like an Angelus timepiece, the Angelus manufacture blends the very best of classic haute horlogerie with ultra-modern watchmaking production methods. While the Angelus manufacture employs a number of skilled artisans who use time-honored techniques and tools to delicately craft and finish components using traditional methods, it also boasts a state-of-the-art production facility featuring semi-automatic machines —lathes, milling machines, drills, pointing and centering tools— and CNC machines programmed and operated by experienced technicians, engineers and watchmakers. The seeds of a new Angelus movement and timepiece are typically sewn in the bureau technique, where the latest Computer-Assisted Design (CAD) programs are used by Angelus movement constructors to design and model the latest concepts and ideas. The manufacture embraces horological tradition by working classic materials such as precious metals, steel and brass, as well as the challenges and possibilities presented by modern materials, e.g. maraging steel, copper alloys, aluminum, titanium and carbon fiber. Where necessary, components and materials undergo thermic treatments —tempering and annealing, for example— to make them more resistant. The skilled craftsmen of the Angelus decoration department provide an inimitable, personal touch to Angelus creations by adorning plates and bridges with artful, traditional finishes including Côtes de Genève, circular graining, snailing and sunray guilloches using traditional watchmaking tools guided by experienced human hands. Spectacular modern finishes can also be achieved using the latest technology such as laser engraving. Hours are dedicated to beveling and polishing pieces by hand. Such fine-finishing draws the very best qualities from the materials, with the resulting plays of light and glinting reflections highlighting their beauty. The steady and dexterous hands of the watchmakers then painstakingly assemble the final timepiece. 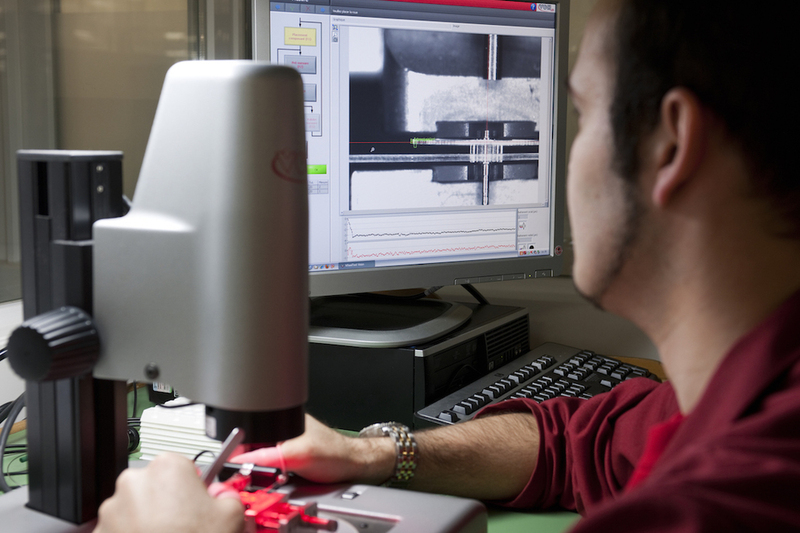 Meticulous quality control checks are performed during each process, between operations and, of course, on the completion of the finished timepiece, using a variety of measuring equipment – digital sensors, microscopes, binoculars, photo-cameras, gauges and projectors – to conduct a battery of checks including precision, torque, strength and water resistance tests. Throughout, the Angelus manufacture team strives to continually innovate and is always researching and investigating new techniques, as well as keeping abreast of developments in other fields of fine mechanics. In a few days, we'll show you the first creation that comes out of the rebirth of one of the most iconic and legendary manufactures that has ever existed. For more info on Angelus click here.